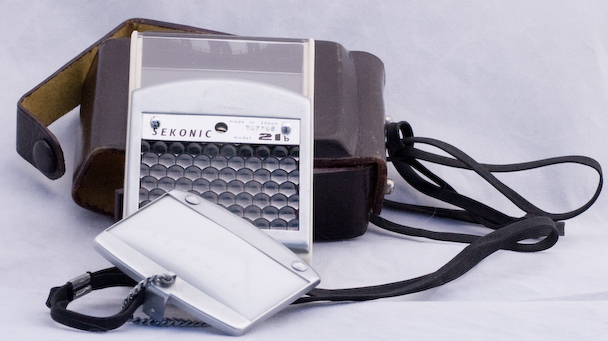 Sekonic liked to give most of their meters names, but as far as I can tell, this one has no name, just a model number. It's larger than it may look in the photo: about the size of a pack of cigarettes. Nice, big calculator dial that you don't ahve to squint to read. It's an interesting meter—I haven't seen another quite like it. First off, it's got that big selenium cell on the back (see photo below). Weston Masters and Norwoods have large cells, but the vast majority of other makes and models put small cells on the slim edge of the meter case, and used an optional "booster" cell if they needed to gather more light. This one has the cell right on the back, so there's no need for a booster. It also has a large clip-on incident cover, but that was a common accessory at the time; the only difference here is that it's very large. If you hold this thing, you have to handle it like a Weston Master: at eye level, with your hand holding the edges of the meter and making sure your fingers aren't blocking the view of the selenium cell. Reading it takes some getting used to. 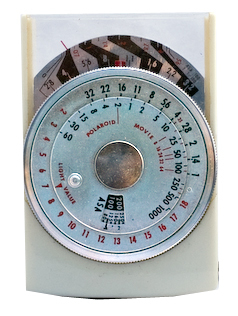 First you set the ASA (ISO) film speed in the little window in the calculator dial face. Let's say it's ASA 100. You hold up your meter and take a reading. The needle is floating at the extreme left, just on the edge of the meter scale. If you look at the scale, there are alternating black and bare-metal zones. There's a series of numbers on the outer edge painted red, and another series on the inner edge (next to the dial) painted black on bare-metal, or bare-metal on a black background. Look at the outer edge. Let's say the needle is right by the red numeral 2. There's a little nub on the outer edge of the dial right over the meter scale. If you turn the dial you should see it move. See how the red 2 is in a black zone that zigs over to a 1.6 next to the calculator dial? Turn the dial until the nub is right by that 1.6. Now look at the right-hand side of the calculator dial: those are your ƒ/stop (outer ring) / shutter speed combinations. In this case, we could use 1/200th at ƒ/1.4, or 100th at ƒ/2, pr 1/25th at ƒ/4, and so on. You can also direct-read with this. Assuming an ASA of 100 and a shutter speed of 1/100th, the outer scale (in red) will tell you the ƒ/stop to use. If you're using ASA 50 and set the camera to 1/50th, you read the ƒ/stop from the inner scale. There scales are repeated on the other side, if it's convenient to read it that way. The scales and the size of the cell make it good for lower-light work. Mike Butkus has a copy of the instruction manual, and it's worth it because it's quite nice. It gives more instructions than many do on how the meter works, how to use it well, and if you're so inclined, offers the K and C calibration levels, so you can either calibrate this meter if you have a standard light source, or you could calculate the number of footcandles or candles-per-square-foot that the meter is seeing. Useful? Maybe or maybe not, but it's nice that they provided it. Most people never bothered at all.